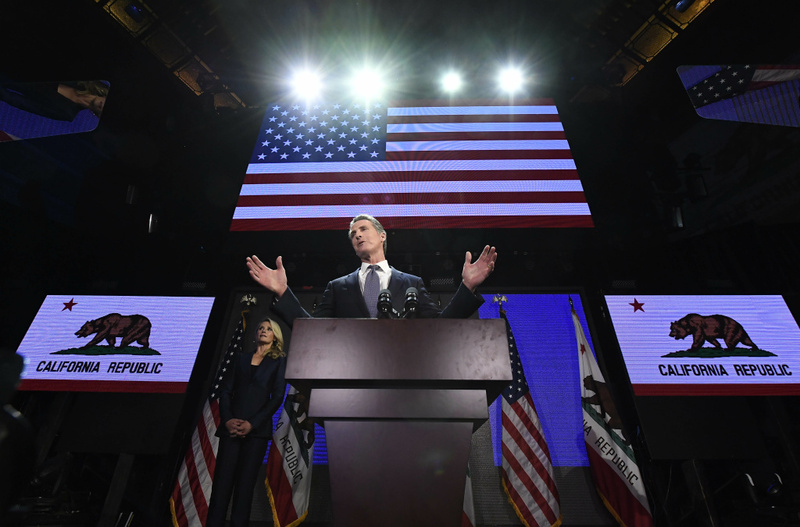 Democratic gubernatorial candidate Gavin Newsom speaks during election night event on November 6, 2018 in Los Angeles, California. In his Thursday budget proposal, Governor Gavin Newsom proposed cutting state dollars from local governments that don’t build enough housing. The governor said he would create new housing targets for every region and withhold transportation revenue for cities that didn’t clear the bar. His budget also included about $2 billion in funding for various homelessness and housing initiatives. Proponents said it made sense for Newsom to tie transportation funds to housing and are lauding the creation of an enforcement mechanism. Opponents argue that there are too many variables in homebuilding that are outside of local control, and that cities shouldn’t be punished for circumstances created by market forces. Newsom wasn’t clear about which specific money would be leveraged, initially saying during his presser that it might be gas tax generated revenue. This sparked backlash from both proponents and opponents of the tax, who argued that repurposing or withholding funds would disregard the will of the voters. According to the LA Times, Newsom then said that general state transportation money would be used instead -- so the specific money source is still unclear. What do you think of Newsom’s plan to leverage transportation funds to incentivize cities to build more housing? Is this fair to areas like the Inland Empire or Central Valley, where the funds for housing projects are tighter?